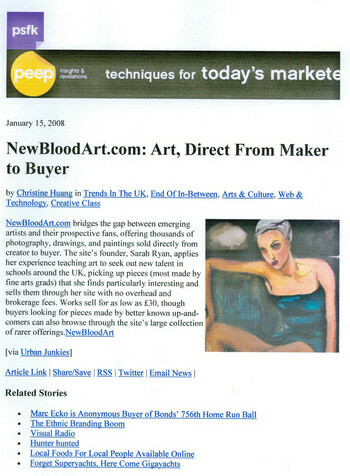 NewBloodArt.com: Art, Direct From Maker to Buyer NewBloodArt.com bridges the gap between emerging artists and their prospective fans, offering thousands of photography, drawings, and paintings sold directly from creator to buyer. The site's founder, Sarah Ryan, applies her experience teaching art to seek out new talent in schools around the UK, picking up pieces (most made by fine arts grads) that she finds particularly interesting and sells them through her site with no overhead and brokerage fees. Works sell for as low as £30, though buyers looking for pieces made by better known up-and-comers can also browse through the site's large collection of rarer offerings.